The Latest Quick Possession Homes From Pacesetter! Starting a new job? Another baby on the way? Simply fed up with your never-ending home renovation to-do list? Whatever your reason for needing a new home without the wait, we've got your solution. 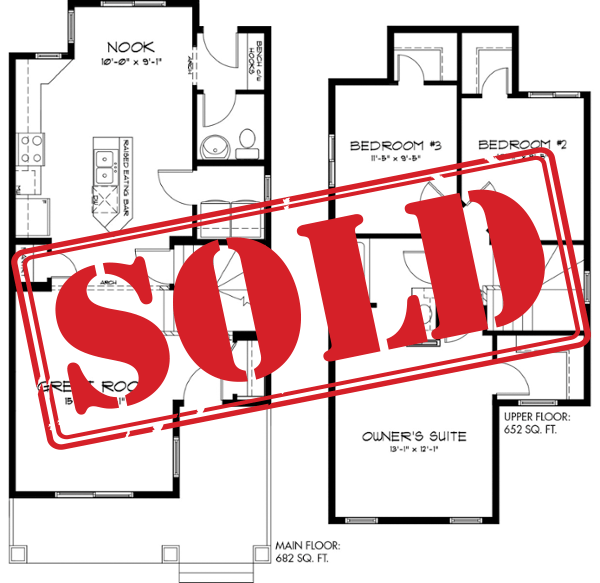 We are continually building superb, masterfully-crafted homes... just for you! Surrounded by green space galore, Southcreek is a peaceful community in Stony Plain. With every amenity nearby, Southcreek is the ideal neighbourhood for families. Vienna boasts a breathtaking 1,856 square foot floor plan with a front attached garage, 3 bedrooms, 2.5 bathrooms, and an extravagant owner's suite. Vienna provides every luxury: an open plan main floor that features a large central island, walk-through pantry; a magnificent upstairs loft across from the laundry room; 2 secondary bedrooms with enough room for growth, and an owner's suite that features a large closet, and spa-like ensuite. Welcome to beautiful Summerwood, a Sherwood Park community that blends the natural beauty of Strathcona County with the convenience of urban living. Zoe is a 1,551 sq. ft. duplex that is perfect for first time buyers, downsizers, or new families. 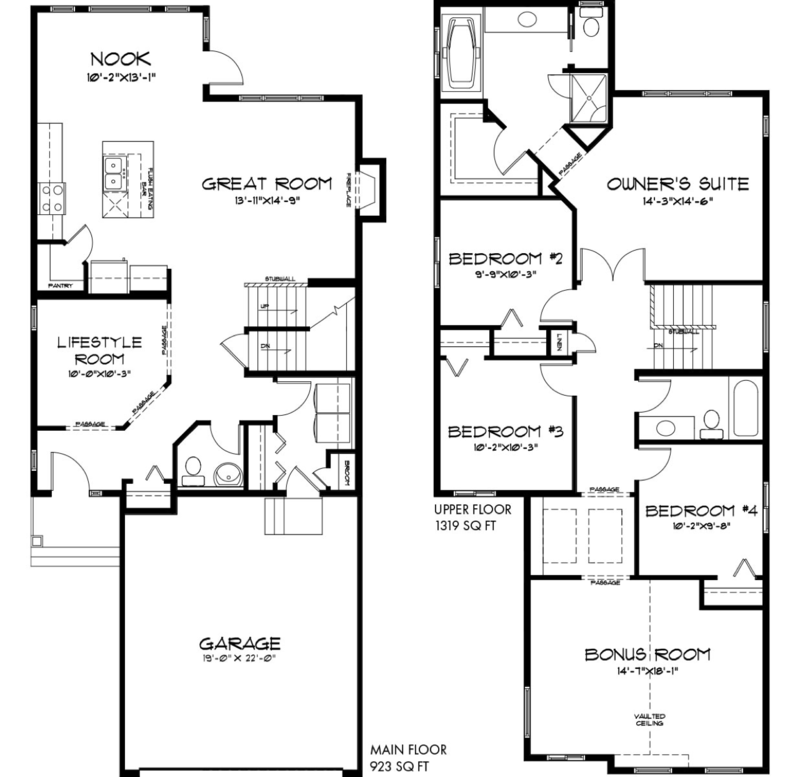 Zoe features an attached garage and an intelligent design that maximizes living space in an open-concept design. On the main floor, a wide front entryway leads to the connected great room, kitchen, and nook. On the second floor, an upstairs laundry, two secondary bedrooms, and a spacious master bedroom and ensuite with walk-in closet is your personal haven after a long day. Achieving a best-of-both-worlds quality, Graydon Hill is a community that incorporates the charm of Ranch-style architecture with a modern twist. Built near an environmental reserve as well as a variety of easily-accessed facilities, residents benefit from balance in aesthetics as well as practicality. The Paladin is a perfect family home that features 1,586 square feet, 3 bedrooms, and 2.5 bathrooms. When guests arrive, they'll enter by way of the front verandah and great room - a bright area with long sightlines to the rear of the home. In the kitchen, a full height tile backsplash and a long central island with quartz countertops is the perfect space for preparing family dinner, or catching up with friends over coffee. By the back door, built-in shelving is convenient for families after a day at work and school. Upstairs, a vaulted ceiling runs through the central hallway and into the owner's suite. The main bathroom, laundry closet, secondary bedrooms, and master bedroom are all convenient by way of the main hallway with plenty of room for families. 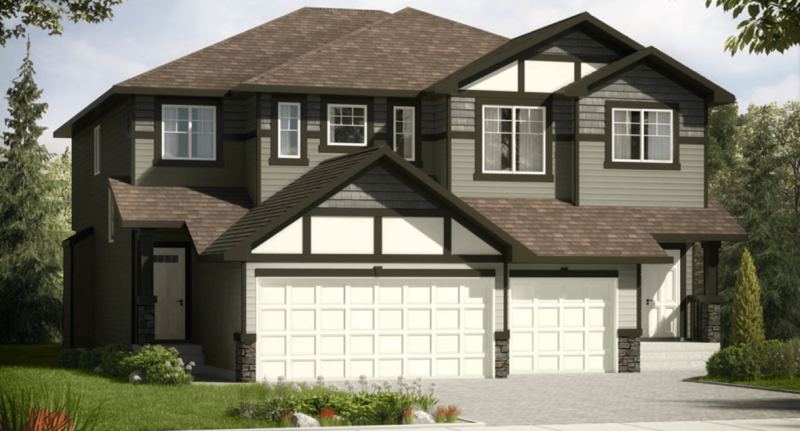 Nestled in beautiful Copperhaven, Spruce Grove, the Mackenzie is a marvelous 2,242 sq. ft. front attached garage home. 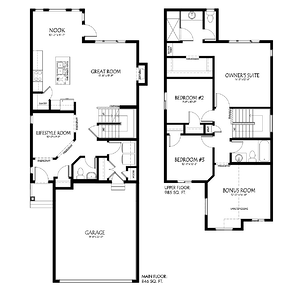 Complete with the highest quality finishes, the Mackenzie is a home that is built to impress. 4 bedrooms and 2.5 bathrooms offers plenty of room for growth in the charming community of Spruce Grove. As you enter, you'll be captivated by luxurious hardwood flooring, a versatile lifestyle room with French doors, and a kitchen that will inspire any chef. Mackenzie's open concept is ideal for visiting with guests over dinner, and the spacious bonus room is perfect for family movie night. Cavanagh is southwest Edmonton's connected community. Minutes away from every amenity, your family can enjoy life in the Maverick. At 1,361 sq. 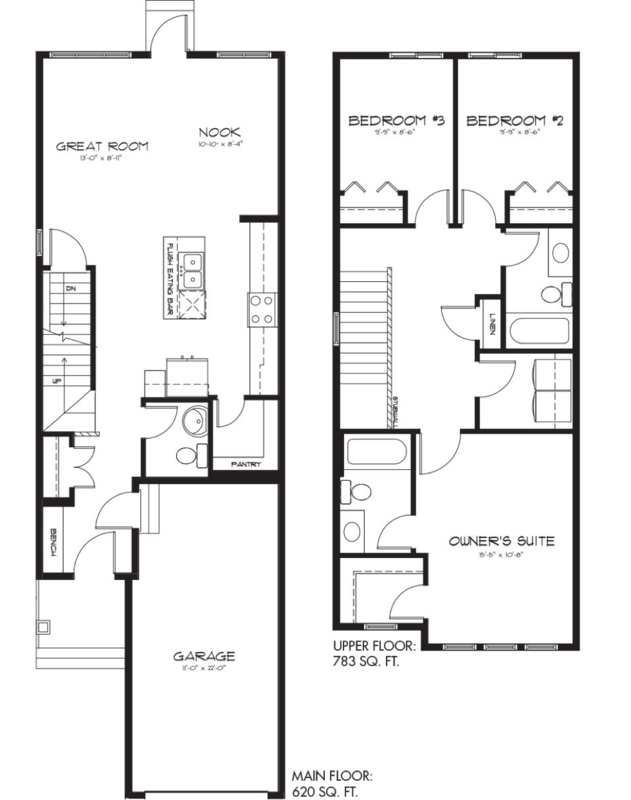 ft. and featuring 3 bedrooms and 2.5 bathrooms, Maverick is a perfectly-sized rear-detached home. 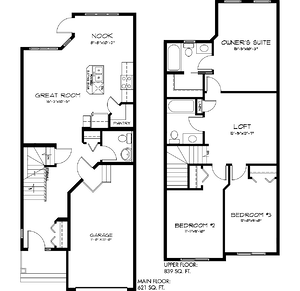 With a functional, open-concept floor plan, the Maverick is a great starter home for families. Tall ceilings on the main floor are complemented by a beautiful kitchen. Full height tile backsplash, tall upper cabinets, a silgranite sink, and a stainless steel over range microwave is a warm, welcoming retreat for friends and family. Live life in the sun at Jensen Lakes: St. Albert's first beach community! Jensen Lakes blends beachside living with urban convenience, and is home to the unforgettable Lazzaro. A recent CHBA Awards finalist, Lazzaro is a 1,460 sq. ft. half duplex with 3 bedrooms and 2.5 bathrooms. Lazzaro brings the outside in with ample windows on the main floor, an open concept floor plan, and a location that is steps away from the beach. The Lazzaro features a bright, beautiful kitchen with full height cabinetry equipped with crown moulding, a stunning backsplash, 1 & 1/4" quartz countertops, and a stainless steel over-range microwave. The main floor is bright and refreshing thanks to the wall of windows in the nook and great room. Upstairs, the loft is a perfect spot for family hangouts, and a convenient second floor laundry makes chores easy. Lazzaro provides room for growth and a spacious owner's suite that promises comfort after a day on the lake. Welcome to Walker Summit: Edmonton's southeast community that is nearby every amenity! 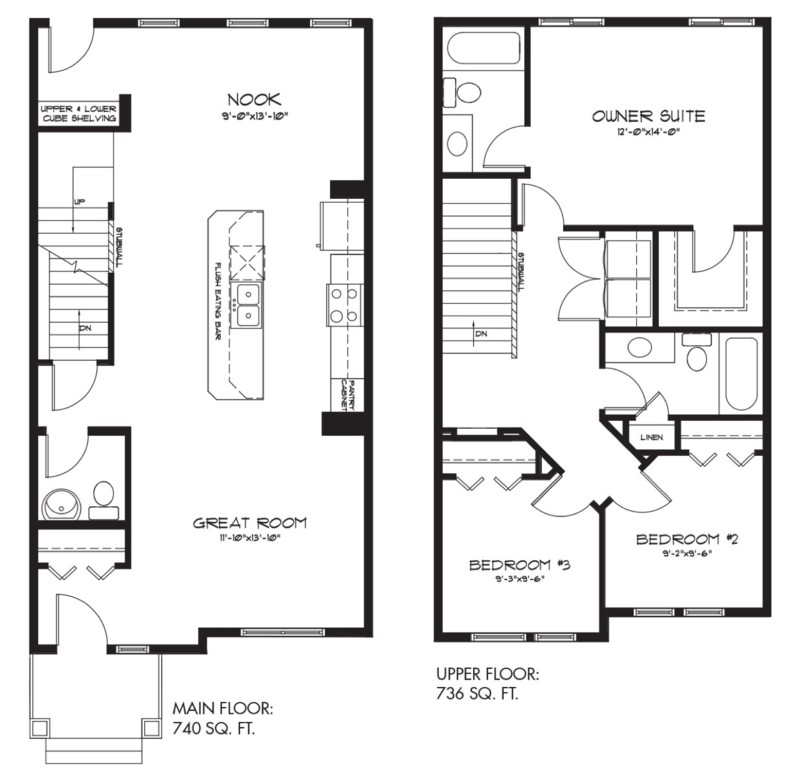 The Calder is a 1,476 square foot townhome designed with small families in mind and features 3 bedrooms and 2.5 bathrooms. Calder's main floor is outfitted with luxurious vinyl plank flooring, and in the central kitchen, a breathtaking island with Maltese quartz countertops and a full tile backsplash. Calder's open concept main floor is perfect for entertaining or a night in with family, while the upper floor features a closet laundry for easy chores, and a main bathroom that makes mornings convenient. College Woods at Secord is a peaceful west Edmonton community with quick access to the Anthony Henday and Whitemud Drive. Nestled within the protected trees and wetlands of College Woods, the Vienna awaits family and visitors. Welcome to beautiful Summerwood, a Sherwood Park community that blends the natural beauty of Strathcona County with the convenience of urban living. The Paladin is a perfect family home that features 1,586 square feet, 3 bedrooms, and 2.5 bathrooms. When guests arrive, they'll enter by way of the front verandah and great room - a bright area with long sightlines to the rear of the home. Located in beautiful Trumpeter among scenic lakes, parks and wetlands, the Affirmed is a 1,397 square foot Townhome that's perfect for first-time buyers. With 3 bedrooms and 2.5 bathrooms, it's built to accommodate a growing family, and its proximity to the city means you'll never be far from all the amenities you need. The Affirmed's open concept main floor means you can always keep an eye on the kids no matter where you are, and the handy mudroom makes it easy to get everyone in and out while keeping things clean and tidy. 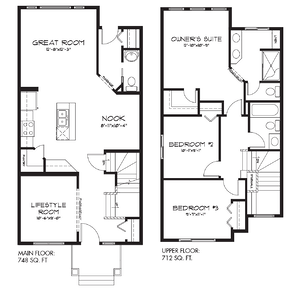 The Lily in Laurel Crossing in Southeast Edmonton is a spacious duplex with 3 bedrooms and 2.5 bathrooms in its 1,534 square foot floor plan. As well as the three bedrooms there's also an upstairs bonus room so whether you're first-time homeowners, busy professionals who need home office space, or a multigenerational family looking for a place that suits everyone, you'll be able to tailor this home to suit your needs. 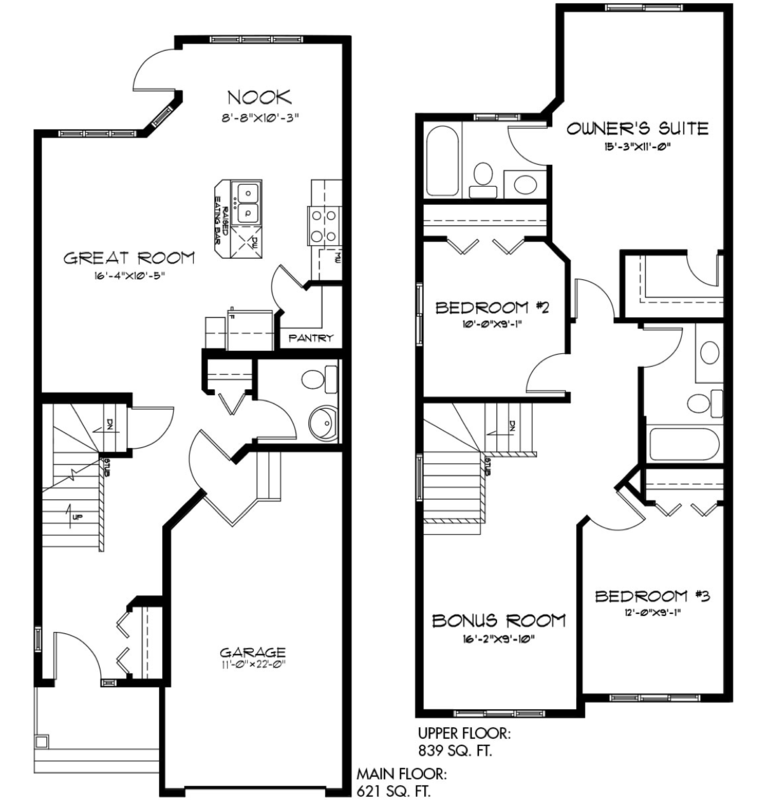 If you and your family need even more space, the Mackenzie in Newcastle is the home for you! 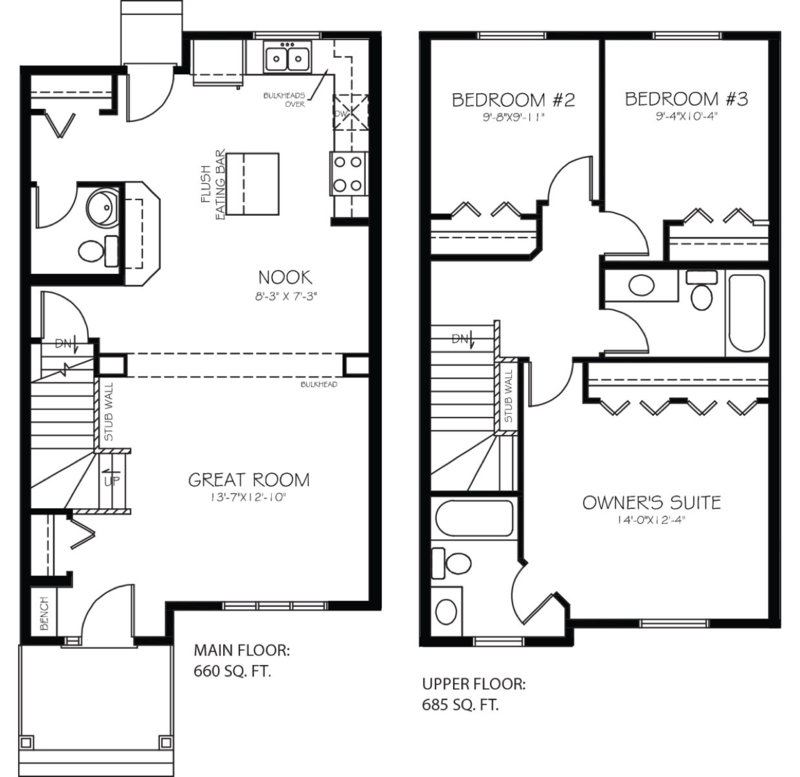 At a comfortable 2,242 square feet, the Mackenzie not only features a decked out Owner's Suite (with ensuite and walk-in closet!) 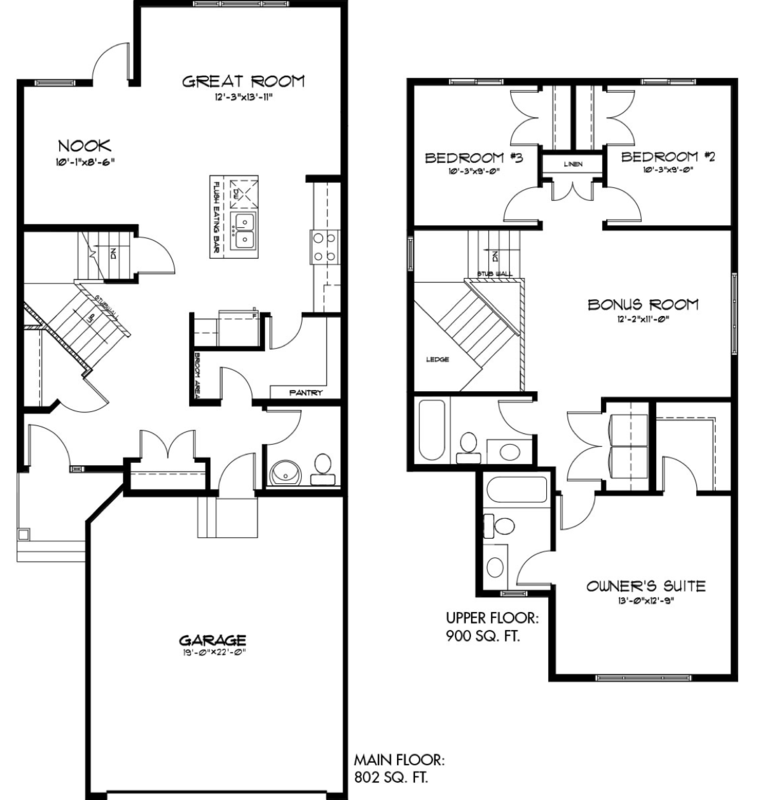 but an additional three bedrooms, a bonus room and a lifestyle room on the main floor. It's also a front-attached home, meaning it has a spacious garage attached to the front of the home. If you've been looking for a bigger place to live, you can't get much bigger or better than the Mackenzie! The Lazzaro in Southcreek is the perfect choice for active families who enjoy spending time experiencing the great outdoors! This 1,460 square foot home has 3 bedrooms and 2.5 bathrooms and is located in the beautiful Southcreek community of Stony Plain. Bordering Atim Creek and a large nature reserve with extensive walking trails, you'll never be far from nature when you live here. Located in southwest Edmonton, the Madeline model in Desrochers will satisfy anyone who wants to enjoy all the modern conveniences, but still wants to experience nature and stay eco-friendly. Desrochers features a 13 acre preserved natural tree stand, as well as 12 acres of carbon-neutral man-made wetlands. All homes in Desrochers are built to meet a minimum Energy Rating and the community is running an innovative solar energy program. If sustainable living is important to you, this home is a great choice! The Maverick, in Summerwood in Sherwood Park features 3 bedrooms and 2.5 bathrooms in its 1,342 square foot layout. Situated in Sherwood Park, this is an ideal spot for people who still want to have easy access to the city without the hassle of city living. This scenic creekside community boasts a huge urban forest, landscaped parks and walking trails, while still maintaining easy access to Yellowhead Trail and Highway 21. 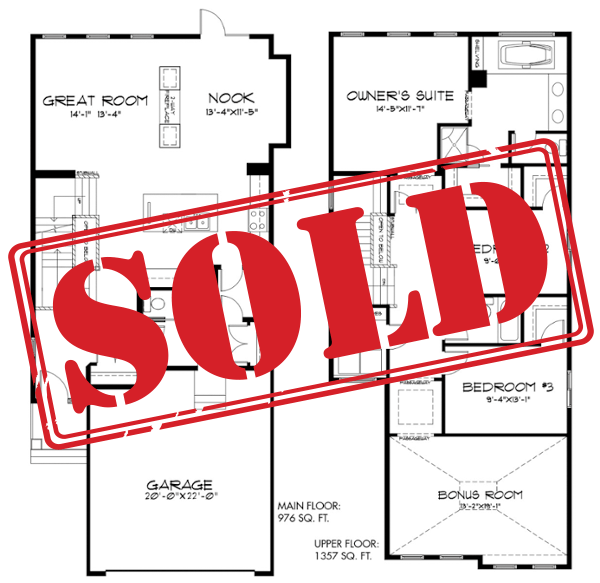 The Bristol in West Secord is a first-time homebuyer (or downsizer's!) dream. Low maintenance, ultra modern and beautifully finished this 1,460 square foot townhome features tons of functional living space. The Bristol also includes three bedrooms, two and a half bathrooms and a lifestyle room - perfect for a home office, den or separate dining area. If you're looking for the ultimate family-friendly community, then you'll definitely want to consider Cy Becker. Not only is this neighbourhood close to schools, shopping, services and commuter routes (such as the Henday and Manning Drive), Cy Becker has also won the 2016 Award of Excellence for Best New Community (thanks to it's famous All Seasons Park and great location). Of course, the home styles here are definitely a contributing factor - and the (nearly) move-in ready Maddy II is a perfect example. The 1,856 square foot Vienna features three bedrooms, two and a half bathrooms and is a favourite among front-attached home seekers. Why? Well, it could be because the owner's ensuite is more like a spa getaway than a bathroom (it includes a soaker tub, dual vanities and a walk-in shower) or perhaps it's due to the second-floor laundry, bonus room and/or functional first floor layout. One thing's for certain though, these incredible features paired with the amazing community of Glenridding Heights means this home won't last long! The Uplands at Riverview is a picturesque and thriving new community in popular Southwest Edmonton. In addition to family-friendly amenities such as schools and rec centres, you'll also find an abundance of family-friendly homes. This includes the 2,437 square foot Oscar. We think you'll agree with three bedrooms, two and a half bathrooms and a roomy front attached garage, you'll have everything you need. Last but not least for this chilly month of October, we'd like to tell you about the Carson in Northwest Edmonton's Rosenthal community. Close to all the action (including West Ed, the River Cree, the Whitemud and the Henday), the Carson is perfectly situated for those who like to get out and enjoy our city. A 1,650 square foot laned model, this home comes with three bedrooms, two and a half bathrooms loads of great features. If you're looking for quiet, countryside living next to all the amenities of the big city, then you're sure to love Dansereau Meadows. Featuring parks, storm ponds, and tree-lined boulevards, this thriving new neighbourhood includes ample green space, amazing amenities, and beautiful home styles. 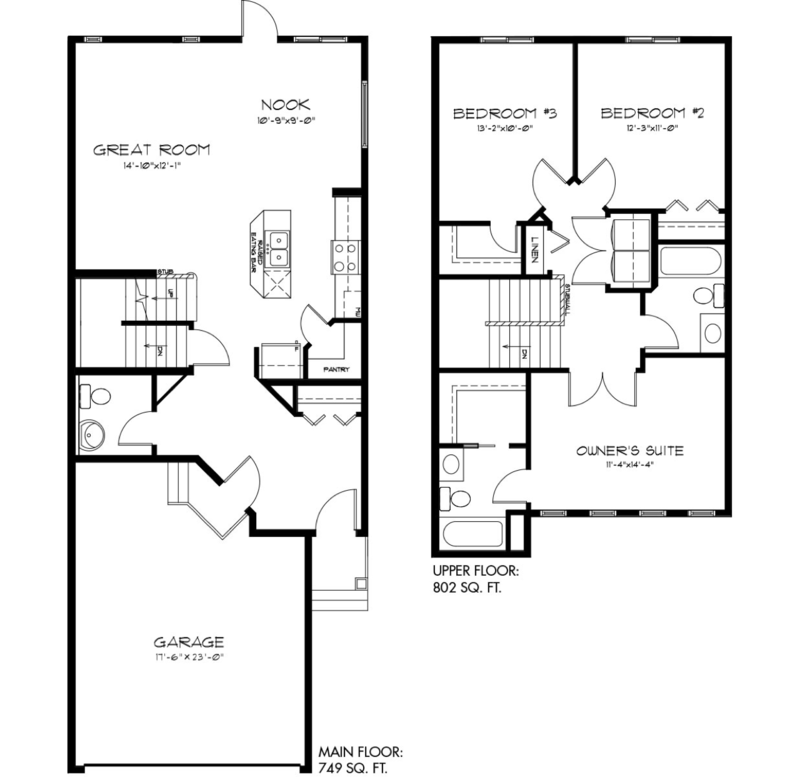 Take the 1,345 square foot Alydar townhome for instance. With three bedrooms, two and a half bathrooms and an open concept floor plan, this stylish model is sure to pique your interest. 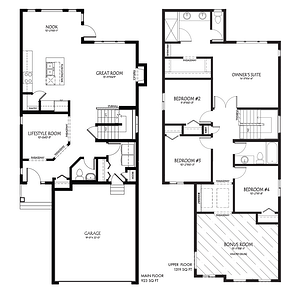 One of our roomiest models, the Lexington in Langdale comes with over 2,500 square feet of living space, three bedrooms, and two and a half bathrooms. Tucked away in Langdale, a modern community characterized by old-English flair, this move-in ready home is a perfect example of front attached living at it's finest. 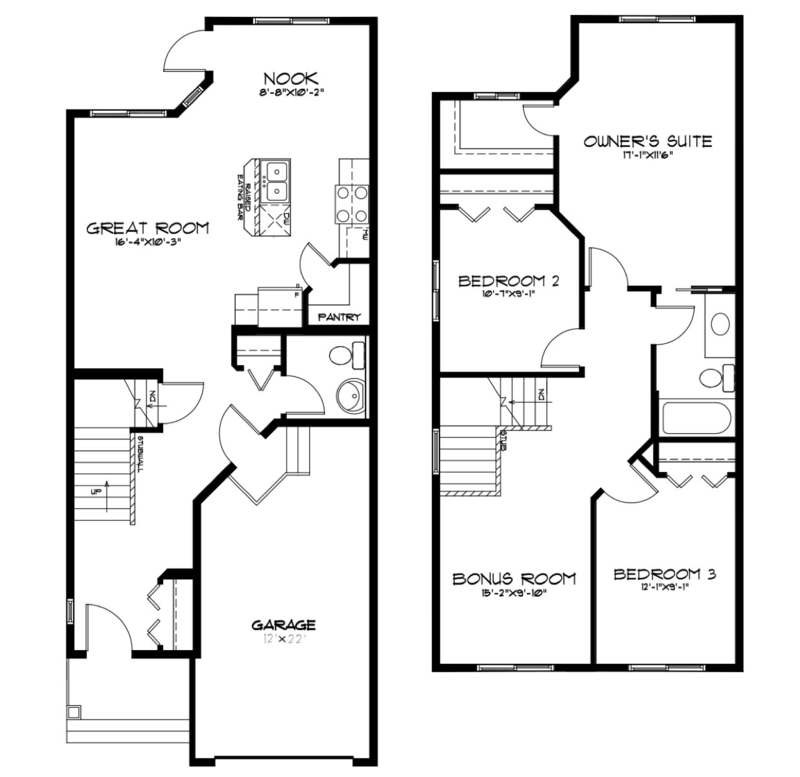 This includes features such as a bonus room, lifestyle room, and spacious master suite. 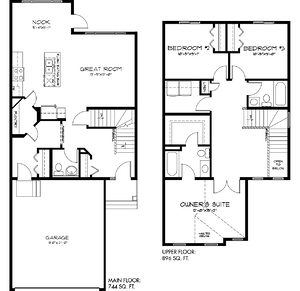 The Carmel is an expertly crafted 1,291 square foot laned home in the heart of Tamarack Common. This three bedroom, two and a half bathroom model boasts tons of curb appeal and is surrounded by schools, parks, playgrounds, shopping, major commuter roads and more - meaning you're sure to have everything you need both inside and outside this home! 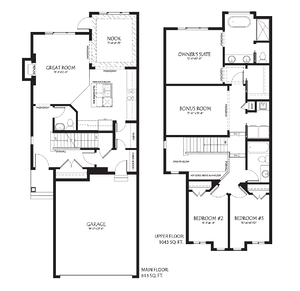 The 2,333 square foot Kristana can only be described as a growing family's dream! Located in College Woods, a premium Pacesetter community in the heart of West Edmonton, the Kristana comes with three bedrooms, two and a half bathrooms and plenty of flexible open living space. If you're looking for more room to spread out in an amazing new home, then look no further than the Hillary in beautiful Griesbach. Sitting at over 2,800 square feet, this quick possession home comes equipped with three bedrooms, two and a half bathrooms and more than enough space for your family to grow. Jensen Lakes offers residents beautiful beach side living, ample amenities and an array of diverse new home models - including the ever-popular Lusitano! This brand-new duplex-style home sits at over 1,600 square feet and includes three bedrooms and two and a half bathrooms; not to mention, many modern features you're sure to love. 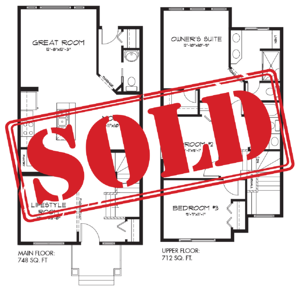 Whether you're looking to buy your first home, downsize, or move-up, the Lusitano has it all. The Madeline in Secord Heights is yet another family-friendly Pacesetter home designed for stylish, comfortable living. With 1,867 square feet of living space, this home comes equipped with three bedrooms and two and a half bathrooms. Built near schools, shops, services and major commuter routes such as the Henday and Whitemud, we think you'll agree the Madeline takes convenience to a whole new level. Well, they could be for anyone – we begin constructing these homes before there’s a buyer to accommodate those time-sensitive situations. But when you find a completed or nearly completed home featuring everything on your wish list, you can call dibs! With possession dates ranging from a few months to immediately, your needs can be met quickly and easily. Take a look at what we have currently available! Crimson at Creekwood Chappelle, a community built for slow walks to its parks and connecting with nature in its many green spaces. A built-in bench in the foyer, with entry access from the covered front porch or garage. An open concept main floor with a roomy corner pantry in the kitchen. 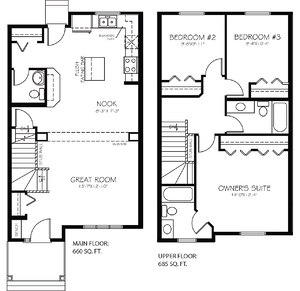 An owner's suite complete with walk-in closet, ensuite, and adjacent laundry room. Just southeast of Edmonton there’s a tree-lined community nestled in the countryside called Dansereau Meadows. If you want to live in the peaceful atmosphere of this community, characterized by parks and storm ponds, now’s your chance! 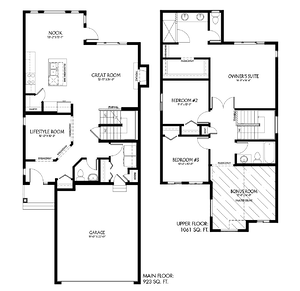 With 2,242 square feet of living space and four bedrooms, the Mackenzie model is a perfect match for families. 9' walls on the main floor and 2' of width added to the front-attached garage. A cut-out lifestyle room at the front of the home for multi-use. 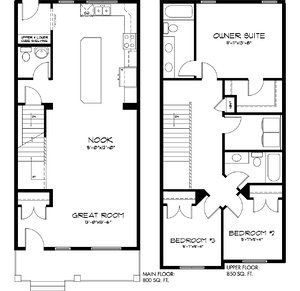 An owner’s suite augmented by a four-piece ensuite and walk-in closet. A large bonus room with vaulted ceiling through a passageway on the second floor. Stereo and security system rough-ins for future installation. While it’s our newest southeast community, Walker Summit has been a hit from the start! With a prime location just south of Ellerslie Road and a wide variety of housing types for any stage of life, it’s easy to see why. If you can’t wait to be a part of this growing neighbourhood, you don’t have to! This 1,460 square foot Bristol townhome is here waiting for you to move in immediately. 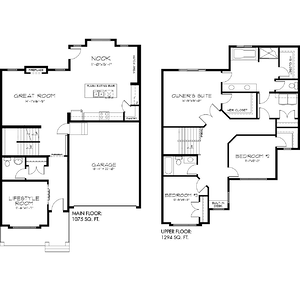 A lifestyle room just off the main foyer offers spacious and versatile living space. A rear entryway is equipped with a storage closet and a convenient water closet. A corner pantry and central island add functionality to the open concept kitchen. The owner’s suite boasts a walk-in closet and a four-piece ensuite. Comes with a rear detached garage. Looking to plant your roots in West Edmonton, but craving peace and nature around your home? South Ravines in Devon is where you need to be. Just 15 minutes from West Edmonton, you’ll stay in close proximity to the amenities you need while living in a scenic sanctuary you’ll love. 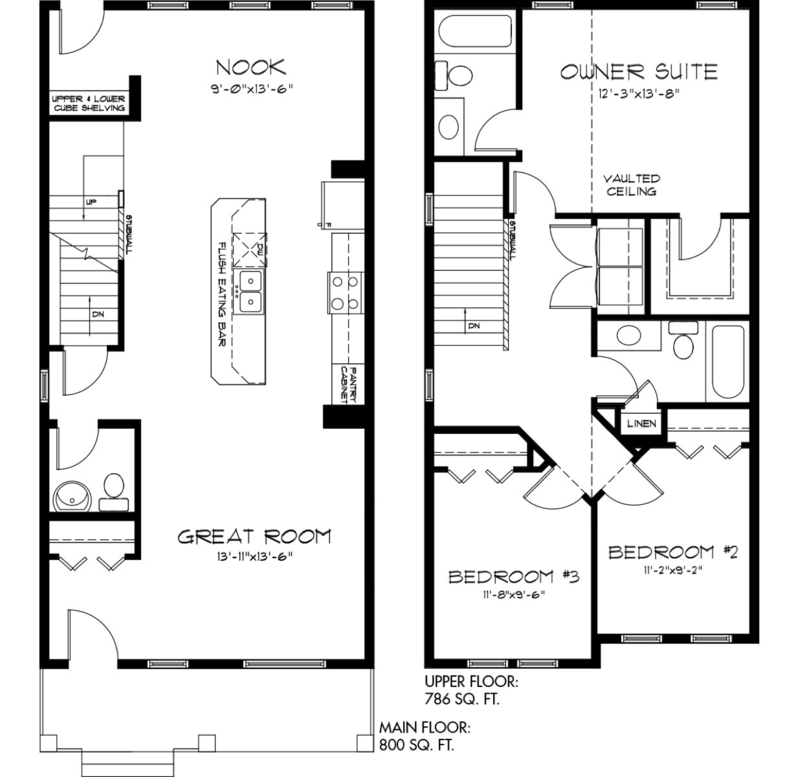 Make this your reality with the Ethan II duplex – it has everything your family needs in an ideal 1,390 square feet. 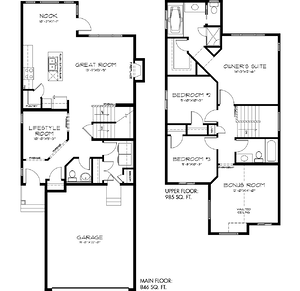 An open concept main floor combining the kitchen, great room, and dining nook. High-quality quartz countertops in both the kitchen and all bathrooms. Gorgeous hardwood flooring throughout the main floor. The bonus room on the upper floor has been replaced with an open and airy loft. 212 square feet added to concrete driveway and a front-attached garage. Life right in West Edmonton can be just as aesthetically pleasing. Homes in the College Woods community are tucked into a natural setting of abundant green spaces and a charming community pond. All this, while being in close proximity to major roadways and desirable amenities. If this sounds like your preferred lifestyle, don’t miss the chance to move into the 2,242 square foot Mackenzie home – it’s perfect for families and will be available in no time! Entry from the garage leads straight into a laundry room complete with plenty of storage space. 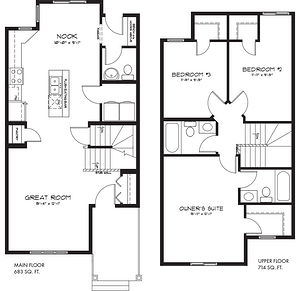 The main floor has an open concept layout, with a lifestyle room providing a separate space for your unique needs. Hardwood and ceramic tile flooring throughout the main floor. A bonus room with vaulted ceiling adds this same value to the upper floor. 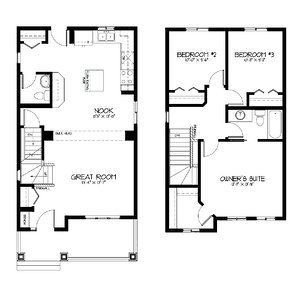 The owner’s suite comes complete with a gracious 4-piece ensuite and walk-in closet. Achieving a best-of-both-worlds quality, Graydon Hill is a community that incorporates the charm of Ranch-style architecture with a modern twist. Built near an environmental reserve as well as a variety of easily-accessed facilities, residents benefit from balance in aesthetics as well as practicality. 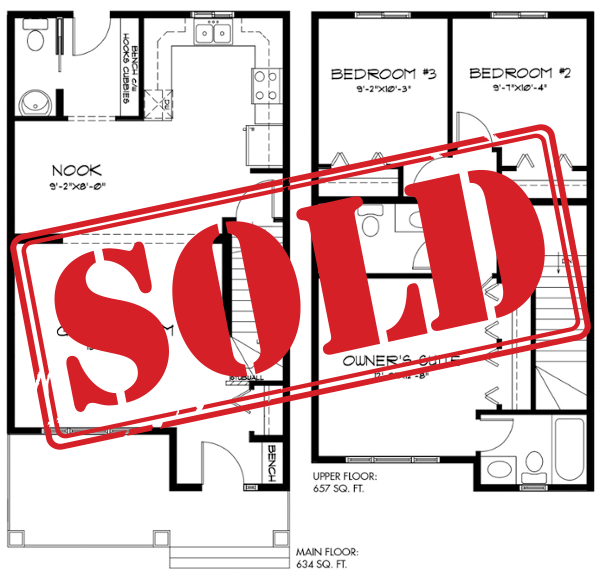 Homes built here follow suit, in their design and layouts, and the Lexi B is no exception. The 1,368 square feet of this laned home is presented in a Modern Ranch design and will be move-in ready soon – but making your offer now means you may also get to make a few additional design choices. A lovely wrap-around front verandah. A large kitchen and dining nook past an arched passageway from the spacious great room. Kitchen accents include ¾” quartz countertops, a top mount sink, and full height tile backsplash. Another archway leading to a rear entry area, complete with a bench and attached half-bath. The owner’s suite features a walk-in closet and the optional 3-piece ensuite has been added. If you’re looking to settle into Fort Saskatchewan, the Forest Ridge community is an excellent choice. It offers the wonderful trails and green space you’d expect from a bedroom community, while still being just a short distance away from Edmonton proper. 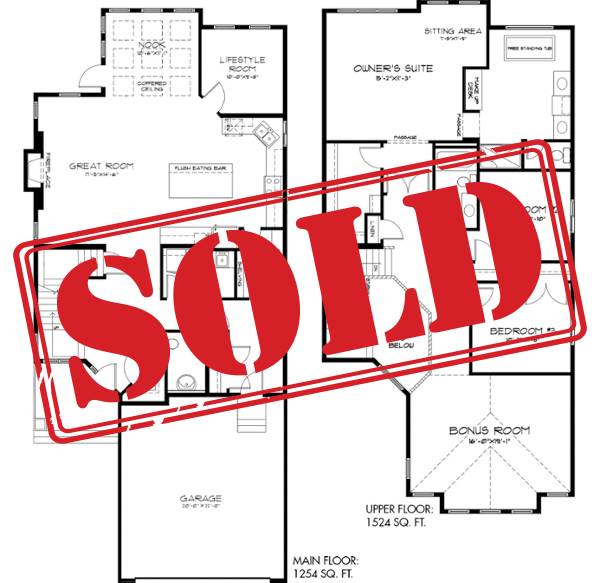 The Caspian is a 1,427 home available for immediate possession here. This is your fast-track ticket to a family-friendly home and neighbourhood. An open bonus room on the upper floor for additional living space. The optional three-piece ensuite bathroom has been included. The kitchen is adorned with a double bowl stainless steel sink and a full-height tile backsplash. Rough-in plumbing in the basement allows for easy future development. A completely open main floor, with an island/eating bar in the centre of the kitchen. Quartz countertops and vinyl plank flooring throughout. This 1,726 square foot single-family home with front-attached garage sits beautifully in the creekside residential Summerwood community. Front, rear, and garage entrances. A large, walk-through pantry leads from the garage entry to the kitchen for easy access. A dining nook and great room are openly connected to the kitchen, featuring a centre island. 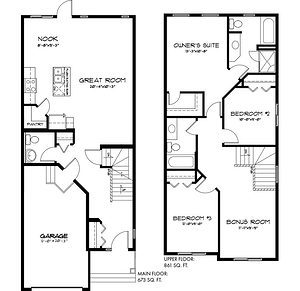 Stairs lead to the upper floor and straight into a bonus room, to be used as needed. A walk-in closet and ensuite bath complete the gorgeous owner’s suite. 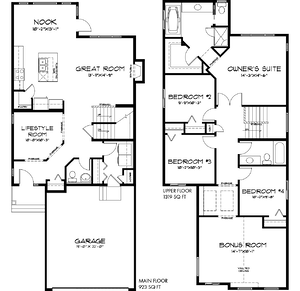 Two second-floor bedrooms and a main bath. Upper floor laundry increases the efficiency of this home. You want your new home to be uniquely yours, but you don’t have to ponder every little detail throughout a lengthy process to get there. Our quick possession homes are built to the highest standards with all the latest features you could want, all they need now is your personal touch! Originally posted August 2, 2017, updated January 22, 2019. 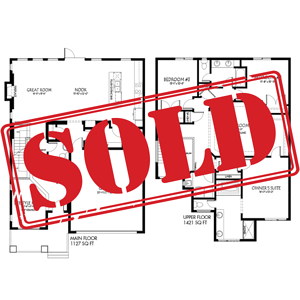 Quick possession homes that have sold are removed periodically.